In just a few more weeks, I will be off on my annual family vacation. 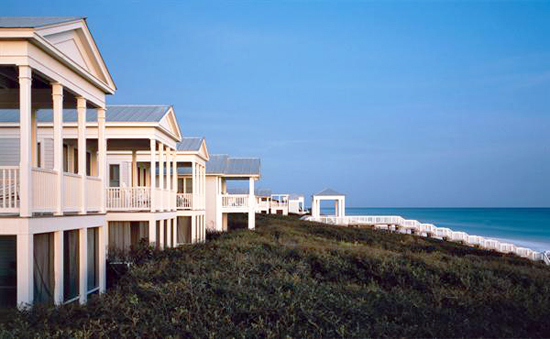 We are heading out to Seaside, Florida – which will be the 5th or 6th time we’ve gone here since my daughter Kate was born. I was talking with her the other day, asking if she had any fond memories of going and if so, what were her favorite ones? Her response? The outdoor showers. Really? What about building sand castles, or eating snow cones, swimming in the pool, staying up late, eating cold fried chicken and on and on? (okay, eating cold fried chicken would be one of my favorites). Nope … the outdoor shower. 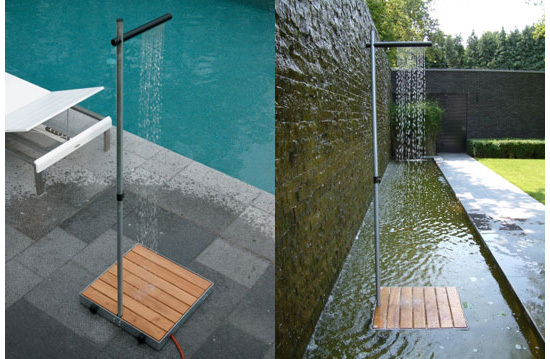 So this got me thinking about outdoor showers a little bit. I suppose I shouldn’t have been too surprised by Kate’s answer. 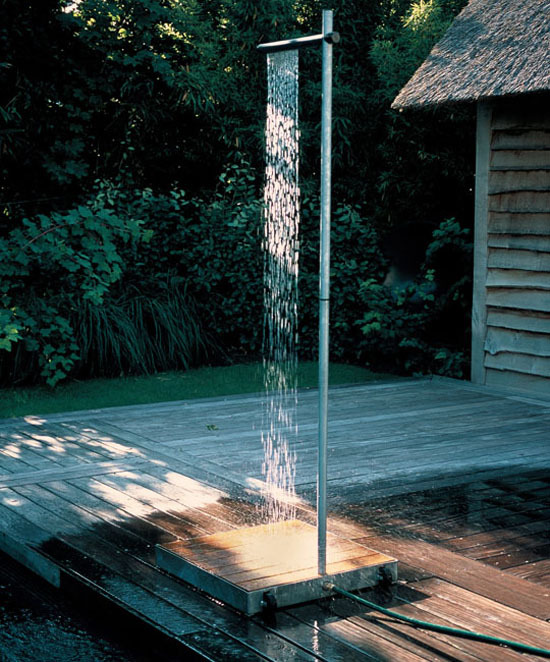 In the world according to ‘Cultural Prodigy & 2nd Grade Colossus – Kate Borson’, an outdoor shower runs a close second to a split-level treehouse in terms of backyard amenities. I understand their need in a coastal environment; you come in from the beach with sand stuck in every possible crack and crevice (…so I’m told, I don’t have any “crevices” yet) and you want to rinse off before dragging that gritty business into the house. This one is from Atelier Tradewinds – a small Belgium company. 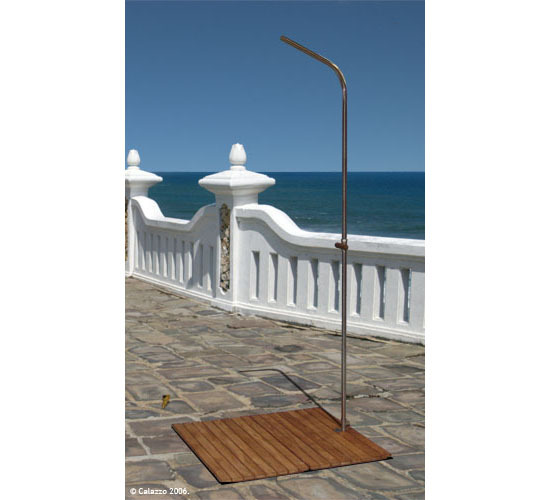 I think this one is quite nice – very simple, clean lines – even has wheels on the base for easy relocation. Also straight forward design – except it doesn’t look like it was made to move from place to place and if that’s the case, I would rather have something a little more. I love this, .. uhm…. shower? I wouldn’t be surprised to learn that some of you are tilting your heads to the right a little, thinking that you might get a different view. At least there’s a place to put your towel (insert your own joke here because I won’t do it for you – it’s too easy and I need more of a challenge). 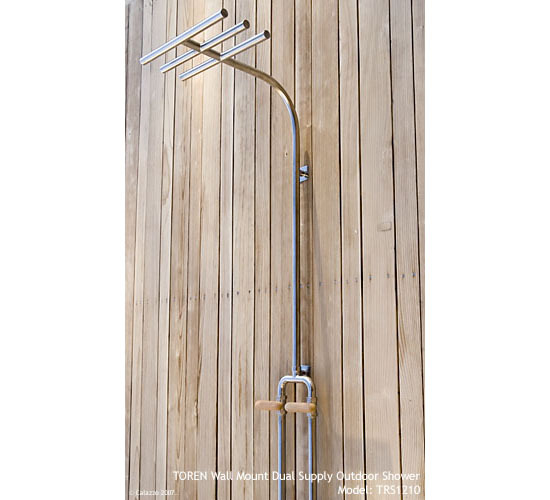 This one helps you get fantastic reception while taking your shower – it’s a multi-tasker! 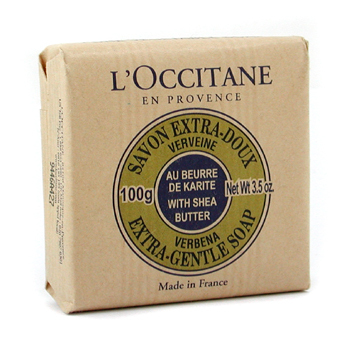 I can understand that scent is a powerful memory trigger so despite the fact that ‘L’Occitane en provence’ soap smells so good that you might consider eating it, there was more to this. Kate was too young to shower by herself so I would always take her into the shower with me. I’d pick her up and just hold her under the water. Since she was always a little tired from being active out in the sun, she would lay her head down on my shoulder and wrap her arms around my neck – her skin warm from the sun and gritty from the sand. I would stand there and just rock back and forth for about 15 minutes prior to removing her bathing suit, soaping her up, rinsing her off and passing her off to her mommy for the ritual of drying and lotion application. It was the experience for her but we both shared that experience. Some of my favorite memories also include the outdoor shower but for reasons other than getting the sand out of my bathing suit.